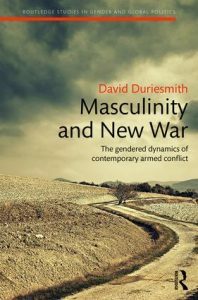 In this title, part of the Routledge Studies in Gender and Global Politics series, author David Duriesmith examines the topic of so-called ‘new wars’ with a gendered lens. In doing so, however, the author uses the concept of new wars as something of a Trojan Horse. While acknowledging and defending the validity of the idea of ‘new wars’, David Duriesmith’s main aim is to challenge one of the central premises of the work of Mary Kaldor (2012) and others – namely the premise that new wars are distinctive in part because they are ‘motivated by divisive identity politics’ (p. 10). Using case studies of Sierra Leone’s Revolutionary United Front (RUF) and South Sudan’s Sudan People’s Liberation Army (SPLA), the author makes a convincing argument that it was contested notions of masculinity – rather than identity-based cleavages – that were the proximate cause of the extreme violence and unconventional group dynamics observed in these conflicts. The exploration of the two cases chosen by the author reflects a nuanced understanding of masculinity theory, and of the dominant local constructs of masculinity in each society. Both case studies make use of cross-disciplinary literature, drawing material from anthropology, sociology, and psychology, as well as political science and area studies. The case of the RUF is perhaps more well-worn by gender scholars (see, e.g., MacKenzie 2012, 2009; Mazurana and Carlson 2004), but the two cases work well together, providing the opportunity to draw parallels while also highlighting difference. At the same time, the cases also draw heavily on the work of (and interviews by) other researchers – this lack of original material being perhaps the biggest shortcoming of the book. The volume’s empirical shortcomings, however, are largely counterbalanced by the book’s novel theoretical advancements. A chapter on ‘Protest and Opposition’, for instance, applies the notion of ‘protest masculinity’ – a concept previously applied to the experiences of marginalised Australian men involved with drugs or crime – to rebel group behaviour. In doing so David Duriesmith sheds new light on one of the enduring puzzles of the RUF, i.e. why members so consistently engaged in brutal violence without any apparent incentive or utilitarian outcomes. Importantly, the book also does not neglect women and girls in its exploration of the motives of men and boys. In tracing the SPLA in particular, the author shows how women were strategically deployed (or not deployed) by the group based on the changing ideology of group leaders related to gender. Particularly, greater centralisation within the SPLA and the enforcement of more rigid construction of gender roles are presented as reasons for an observed rise in reports of sexual and gender-based violence perpetrated by the organisation over time. As women were moved off the front lines and told that their contributions should be limited to care work and reproductive labour, the argument is that women became ‘othered’ even in their own ranks, and men’s ability to access women sexually was presented as an entitlement – a problem that sparked an epidemic of sexual violence that still exists in the region today. Overall, the volume does a coherent job of linking literature on conflict, masculinity, and feminist security studies. In the process of doing so, it offers a new dimension to our understanding of rebel recruitment, civilian targeting, sexual and gender-based violence, and the common pitfalls faced by disarmament, demobilisation, and reintegration (DDR) programmes. Academics focusing on any of these subjects will find something of interest in the book. Practitioners and policymakers, though, may be left looking for more. While David Duriesmith cites a lack of focus on toxic masculine norms as a reason why DDR programmes in South Sudan and Sierra Leone fell short, he does not offer concrete solutions that provide a way forward. The implication that international organisations and/or non-governmental actors involved in DDR should challenge toxic masculinities is intriguing. However, at the same time, it raises, for me, thorny ethical questions about how to construct new masculinities while at the same time avoiding the appearance of cultural imperialism. A chapter exploring DDR processes more in depth would have been a welcome addition, as would be more information on cases outside Africa. A brief case study of Daesh (pp. 118–20) does hint at a broader geographic relevance for David Duriesmith’s arguments – but this could be developed more thoroughly. While these criticisms represent limitations on the scope of the current book, they perhaps also serve to demonstrate the exciting possibilities for future work in this area – a fact the author himself acknowledges (p. 126). In time, one hopes, David Duriesmith himself might have the opportunity to build on his own innovative, well-written work presented in this volume.